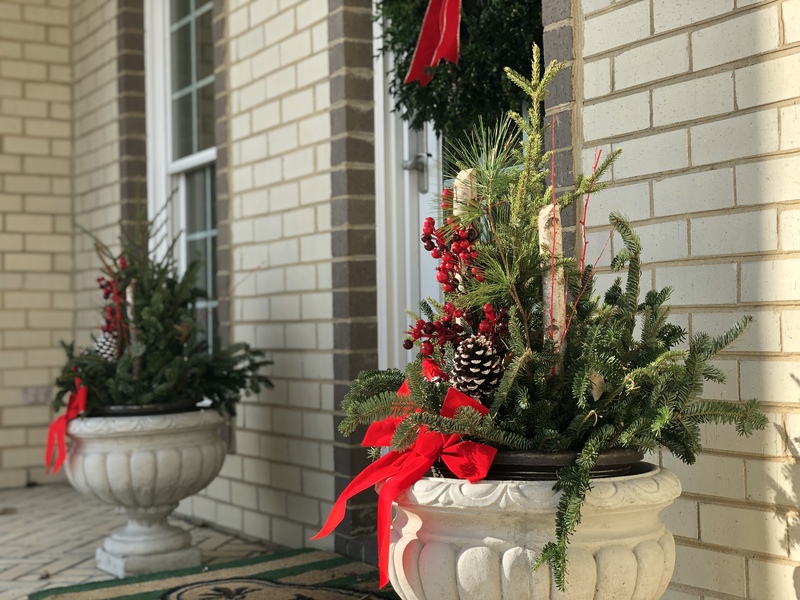 Decorating the Front Porch with a little Christmas cheer is as easy as 1-2-3. And I literally mean 1 wreath plus 2 planters equals 3 items. This is such a busy time of the year, let’s keep the porch simple. To create a simple Winter porch, I picked up 2 planters at Costco to use in our cement french urns. Adding a wreath with a bow is a simple statement too. I attach the wreath to the door using these outdoor hooks HERE. I leave the hook attached to the door all year long, and change out seasonal wreaths. Although I wouldn’t call this wreath simple, I made it in a floral design class and used 6 pounds of boxwood. I will give you a step by step tutorial next week. Another element to add to the porch is an outdoor coco mat, I found mine at Frontgate HERE. Three elements and you’re done! BAM! Onto the next project! I love the bright color against the light brick and the puppy is adorable! Hi Sandra, thank you! He is…isn’t he..Bentley has stolen our hearts…love him. Denise, I was surprised you felt you needed to take a flower arrangement class. I think you could teach it!! Did you make the bow on the wreath? It is beautiful along with the wreath. Hi Donna, you’re too sweet! I was a bit worried that I wouldn’t learn anything new..but I have picked up several useful tips I didn’t know. Will share them next week! No, I did not make the bow, my instructor made it…turned out beautifully and really easy to do too!